On Saturday, June 16, 2018 cricket fans in attendance at the Roy Sweeney Cricket Oval, Gateway Park, in Brooklyn. New York, watching the finals of the Public Schools Athletic League (PSAL) cricket tournament were treated to a clinic in power hitting by young US cricket prospect Alix Husain. The eventual Man-of-the-Match put on a display of batsmanship reminiscent of Shane Watson’s extravagant hitting in the finals of the recently concluded Indian Premier League. 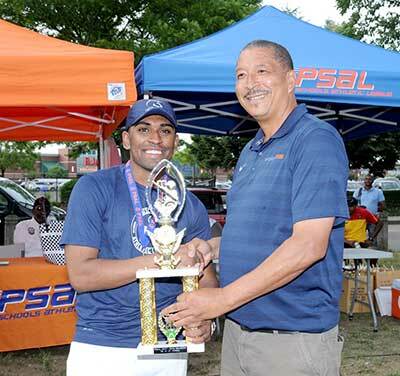 The over 500 individuals who showed up to take in the 11th championship final in PSAL thoroughly enjoyed young Husain’s knock as he tore into all bowlers put up against him. Alix was a one-man wrecking crew, and he destroyed the bowling attack of his opponents. The PSAL final this year saw the John Adams Spartans doing battle with the Jamaica Beavers. Mother Nature cooperated well with us the cricket lovers, by giving us excellent cricket weather. It was sunny and hot, but the cool and refreshing breeze blowing in from the nearby Jamaica Bay, was in fact invigorating. The crowd consisted mostly of kids from the various other high schools that took part in this year’s tournament, but did not reach the finals. Several officials from the various adult cricket leagues in the New York City area were also in attendance. It was a most appropriate setting for a cricket game of this magnitude. After all, two cricket teams from two of NYC’s most fine high schools were competing for the coveted PSAL Championship for 2018. Many thought that the contest was a one-sided affair. Some felt that John Adams, figuratively speaking, just “steam-rolled” over the Jamaica boys. But, I saw it differently. I felt it was a match in which either team had the opportunity to override the other. Seizing the opportunity when it pokes its head was the deciding factor of the game. Jamaica missed a golden opportunity to get the prized scalp of the Spartans batsman Alix Husain early in his inning, before he commenced his rampage. It turned out that this mishap could very well be looked at as the play (misplay) that decided the outcome of the match. There is a saying in cricket circles that “catches win matches”. Interpreted as a side holding on to catches offered has a greater chance of winning than the side grassing chances. Well, if this theory stands true, then Jamaica indeed threw away the game to John Adams. The Jamaica fielders gave Alix Husain “three lives.” He went on to score a magnificent 95 in just 49 balls. He muscled eleven 6’s and three 4’s. Alix was ably supported by Fazal Adib had a cameo of an inning of his own, scoring 34 not out, in just 14 balls, bombarding four 6’s in his power packed knock. He too, was put down twice. John Adams’ Spartans took first strike. In the 4th over they lost the prolific run scoring opening batsman Avin Gangadin with the score on 17. Next man in Alix Husain and opener Tamesh Persaud took the score to 55 and then Persaud fell at the other end, The Spartans skipper was tearing the bowling at the seam. By the end of the 11th over Spartans was 94 for 4. Alix was the only Spartans batsman who was able to negotiate the Beavers’ bowling attack, while wickets were falling at the other end. Let’s turn back the clock a few overs. On 13 runs, Al Alix Husain and his partner attempted to take a sharp leg-bye. He was stranded at mid wicket when the fieldsman behind the keeper totally mishandled the fielding chance. The ball trickled through his fingers and legs. Had he gathered and simply lobbed the ball in to the ‘keeper, Alix Husain would have been run out “by a mile.” That was one play that the Jamaica boys “lived to regret.” Immediately after, Alix commenced on a hitting spree. Two more chances he offered when on 72 and 75 in the same over were not accepted and he went on to score 95. He was ably assisted by Fazlul Adib who himself scored 34 not out after being let off twice. In the last 5.3 overs Adams scored 73 runs, a run rate of over 14 per over. During this period Fazlul was dropped when he was on 4 and again on 7. Jamaica had just squandered the game with those let offs. The John Adams Spartans inning closed at 187 for 8. Indeed, a tall order for a side chasing such a large total. Talk about “scoreboard pressure”! The most successful bowler for Jamaica was Kapeshwar Jagdeo (4 for 32) and Redwan Ahmed (2 for 31). Having to chase 188 run for the win was indeed, a tall order for Jamaica. But, getting the required runs was not beyond the capabilities of the Jamaica Beavers. Four times during the season they had amassed in excess of the 200 run mark. But, it was evident, from the body language of the Beavers, that the final five overs of the Spartans inning had dampened their spirits. Several of the Jamaica batsmen were out to injudicious shot selections. It was clear that they were “in a hurry to catch the last train”. Hey, the train wasn’t going anywhere! All they had to do was to put their heads down, their shoulders against the grinding wheel, and chip away at the Spartans total. But, I suppose the 188 runs for victory was plaguing them. First to go in the Jamaica inning was their run-getter, captain Mohammed Hussain. He went on the last ball in the first over of the Jamaica inning, caught off the bowling of his counterpart Alix Husain, for 0. Within the period of three overs Jamaica was languishing at 3 for 21. A fourth-wicket partnership of 36 between Redwan Ahmed (41) and Mohammed Mahib put a “little life” back into the Jamaica inning. With the fall on Mahib (13), Shad Hussain (53) and Redwan put on a 31-run partnership. But once the partnership was broken, the end appeared on the horizon. From 5 for 88 in 13.5 overs, Jamaica slipped to 8 for 95 at the 16.1 over mark. 14 balls, 7 runs, 3 wickets! In the 18th over the Jamaica supporters were treated to some lofty hitting by Shad Hussain. In that fateful over, bowled by Alix Husain, Shad took him for 20 runs. In his 53-run inning, he hit six 4’s and three 6’s. With the fall of Shad’s wicket in the 19th over, the end and result was imminent, a loss for Jamaica, and a third PSAL championship title for John Adams. In the Spartans bowling effort, Tamesh Persaud was the most successful with a haul of 3 for 23. Joining him in the wicket taking were Alix Husain (1 for 40), Fazlul Adib (2 for 13), Avin Gangadin (1 for 25), and Navindra Singh (2 for 23). That combined bowling effort, supported by excellent fielding, accounted for this well-deserved victory, and the championship. After all, the John Adams Spartans played unbeaten ball for the entire season. Congratulations to Coach Alex Navarette, his assistants, his players, and the entire school body. Way to go Champs!